Police are objecting to the granting of a licence for this year's Bulldog Bash, a biker festival in Warwickshire. Warwickshire Police says it cannot give reasons for its objection because it could prejudice an ongoing court case. 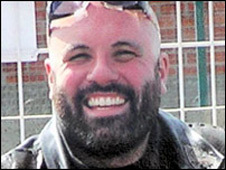 In August 2007 Gerry Tobin, 35, a mechanic from London, was shot dead on the M40 near Gaydon after leaving the event at Long Marston Airfield. Seven men deny his murder and are due to face trial in October, which could last up to eight weeks. The licence application for the Bulldog Bash is due to be heard by Stratford-on-Avon District Council in two weeks.